Skin irritation can be just as bad in dogs as in humans. Dry skin can lead to itching and clogged pours can lead to a dull looking coat. The good news is there are simple things you can do to improve your dog's skin. Whether you change his food or make sure he gets enough exercise, his skin can be free of common irritations. 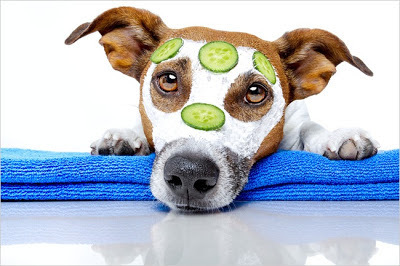 The following are just five ways to improve your dog's skin. High-quality food is important for a number of reasons. First of all, 90% of the dog's coat is made of protein. A quality dog food should have a meat source listed as the first ingredient. Also, the food should be high in omega fatty acids. This will help keep the skin moist and healthy. Avoid foods with unnecessary fillers, such as corn, and dyes. Many dogs have food allergies to dyes and certain grains, which could dry out the skin and cause a rash. Dead hair that isn't removed from the dog's coat can clog the pores and prevent oils from being secreted. These oils keep the skin moist and the coat healthy. Always brush your dog at least 15 minutes per day. During shedding season, you may have to brush your dog twice a day, especially if your dog is a breed that has a double coat. Dogs aren't like humans. Most dogs do well with getting a bath once per month, yet some owners insist on weekly, even daily baths. Bathing your dog too frequently can strip the coat and skin of the oils the body secretes. This will dry the skin and dull the coat. Limit bathing to only when your dog smells. By the way, daily brushing will help your dog smell better because dead hair can stink. The right shampoo is essential for the health of your dog's skin. Some owners make the mistake of using human shampoo or even dish detergent. A dog's skin needs a different pH than these soaps can provide. You want to choose a good soap-free shampoo that is made for dogs. Oatmeal-based shampoos are a good option because oatmeal is good for the skin and coat. Even notice how your skin and hair look so much better when you exercise regularly? The same is true for dogs. Making sure your dog gets daily exercise will stimulate the blood and bring nutrients to the skin. Shoot for 30 minutes a day. Better yet, make it a point to go for a walk each day with your dog. That way he gets a workout and so do you. In most cases, a dog's irritated skin can be remedied with simple changes to his diet and grooming. Changes to food can take up to 6 to 8 weeks to show improvement. If your dog doesn't appear to be getting any better or has rashes, a trip to the veterinarian will be necessary to determine the cause of the skin problem and to possibly obtain a prescription dog food or medication. Lisa Mason is a dog owner and lover who writes for Doggie Clothesline, your top stop for all things to pamper your pooch.